The theme was “Volunteers are the HEART of Our Team”. 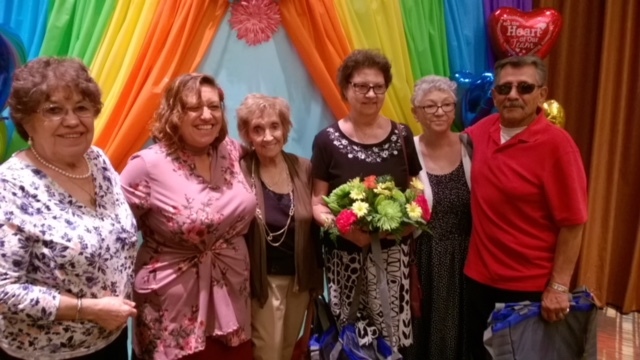 Attendees at the New Mexico Veterans’ Administration Healthcare System Volunteer Recognition Celebration on July 23, 2018, enjoyed a wonderful banquet honoring the volunteers who give their time and compassion every day to our veterans. 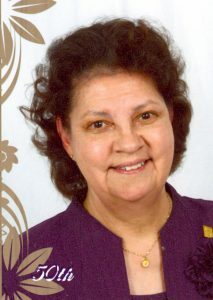 Sister Eileen Jaramillo, O.P., of Albuquerque, was one of the volunteers recognized. Sr. Eileen has volunteered at the NM V.A. since 1998 and has contributed more than 2,796 hours of her time! The guests at her table included family, friends, and Sr. Ada Medina-Dominguez, O.P., M.A. In her 20 years at the NM V.A., Sr. Eileen’s ministry has touched the lives of many veterans, as well as their families and friends. Her initiation into volunteer service began on the Spinal Cord Unit, which brought unique challenges. She then took on her tour of duty as a Eucharistic minister on four floors of the hospital, including the geo psychiatry unit, sharing prayer and Holy Communion with patients in need of The Bread of Life served with hope and compassion. As an integral part of Chaplain Services at the NM V.A., Sr. Eileen prepares music, plays the piano and sings for daily and Sunday Catholic Masses. Those patients that are able attend Mass, and visitors, are always welcomed. There have been countless expressions of sincere gratitude for the music ministry she provides. Sr. Eileen also prepares a dish to share in Fellowship after Sunday Mass, fostering the partnership with fellow ministers and parishioners. Sr. Eileen is blessed to listen to veterans’ stories and has expressed the humility she has felt throughout her service. Having been a teacher at Bataan Military Academy in Albuquerque for seven years, and having earned the title of Ensign, United States Naval Sea Cadet Corp, she feels evermore connected and can share in Navy camaraderie! From quiet works such as office duties in the Chaplain Services office to the Corporal Works of Mercy mentioned above, Sr. Eileen has used the gifts of her Dominican vocation to share Christ’s message and to live the Dominican motto: …to praise, to bless and to preach.